I look forward to checking this out as it sounds like a positive step for our growing little downtown area…? I couldn’t agree more Leo about DT needing the “quick and easy”. Those are things that make an area livable. 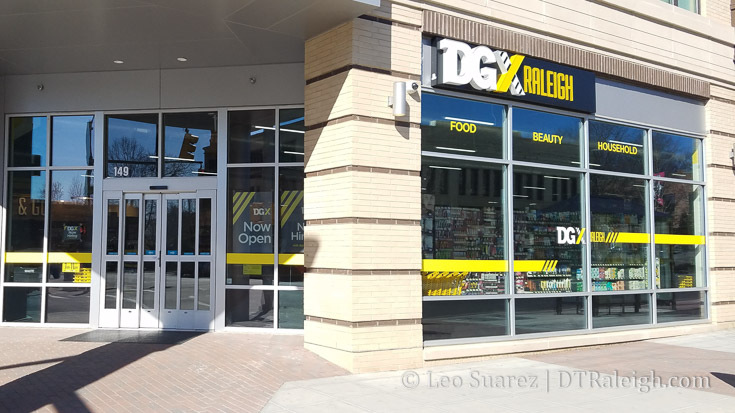 Would love to see a dollar general express built at the Dillon warehouse district, a place where you can grab something quick, and its a short walk to your apartment. I worked on these plans and this was a quick first time fit up of the space. I went in the store the other day and was impressed with the options. Everything you need. DG will do great in this location and Edison Apartments has done a great job attracting some great retail for the first floor retail space. I’ll admit I was a total snob about a Dollar General opening downtown, but after visiting for the first time, I was sold. I’ve been several times since and they always have whatever I’m looking for and the staff is super friendly. I’m so happy to have DGX downtown! I’m impressed with Dollar General stepping into this part of the market similar to what Wal-Mart, Target, and other companies have been doing recently. Dollar General also has also opened grocery stores, often where a traditional supermarket wouldn’t go. http://www.bizjournals.com/triangle/news/2017/03/01/plans-renderings-unveiled-for-10-story-downtown.html New plans for the 10 story building including exploris talked about previously. jk thanks for the link. absolutely love the design of the building. beautiful. wish it was taller though..but i’m happy with the result so can’t complain much. this is the kind of vision we need more of in DT Raleigh. From the article it sounds like they’re planning at least four total buildings, including one that’s supposed to be a signature “gateway” structure into downtown, and another that’s 20-25 stories. If all the buildings feature this level of design, and aim to make a visual statement (which is how I interpret the signature building), then I think it’s definitely going to be something very positive for the city. What will happen to the plot of land that exploris is on off of New Bern Avenue? It’s a large plot. Is it just me or does the new Explorer design “borrow” from the new canopy at the entrance of Raleigh’s new Union Station? Also, FYI this DGX is pretty nice doesn’t have a good cheap wine selection. The CVS has a better selection.